There’s a script called Evil Apps which, frankly, shouldn’t exist. 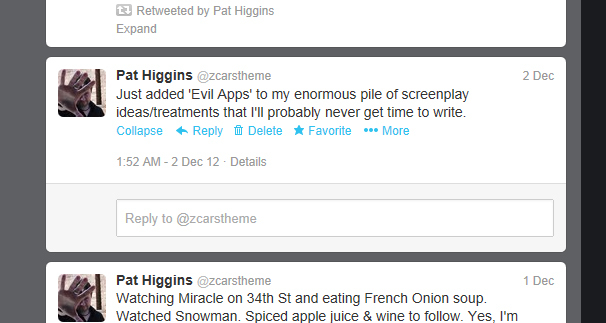 As I write these words, the week before Christmas in 2012, I’ve already got two screenplays in fairly decent shape. They need a bit of a tweak here and there, granted, but my old friends House on the Witchpit and Chainsaw Fairytale are sitting cheerfully on my hard drive awaiting their fate, (which will be, in each case, to either end up in front of the lens as a Jinx Media feature or get sold off to another company and be put into production over there). Those should be my top priority. Not to mention the fact that I’m also putting together delivery packages for various DVD releases at the moment (including the director’s cut of The Devil’s Music that will be going out through Cine Du Monde in the new year), plus assembling a new version of the live show for Horror on Sea, plus the various lecturing and stuff that I do as well. In other words, there is no room in my life for a new script. So, yeah. It was a script that was an ‘idea I’d never get time to write’ on December 5th. A week and a half later, I had the majority of the first draft written. Weird the way these things sometimes drop into your head more or less fully formed. It was absolutely the easiest writing experience of my life, even beyond the oddly simple first draft of KillerKiller back in 2005. Evil Apps went from being a cute idea to a fully functioning script with characters I cared about and a (hopefully) engaging plot in a matter of days. Crazy. So, how does this affect my plans for next year? Well, time will tell. Once the honeymoon period with this project ends, we’ll see where we stand. Either way, it’s been a hell of a productive couple of weeks. So, yeah. Stay tuned. Make sure you follow me on Twitter to hear how the whole thing develops. And come along to the live show, because I’ll probably talk about it there too.